Call today for your Napa Valley Limousine Service – 1.800.380.9788. Tour the wine country in style! Our Napa Valley Limousine Service will pick you up from your Bay Area location and whisk you off to wine country. You and your party can all enjoy the day without the worry of drinking too much. What a better way to impress your date by having them chauffeured around by our Napa Valley limousine service. You can focus 100% on your date and leave the driving to us. Just give us your itinerary and we’ll get you to all your events on time. Not sure which wineries you’d like to visit – no problem. We can put together a tour for you. Just sit back and enjoy the day to its fullest. 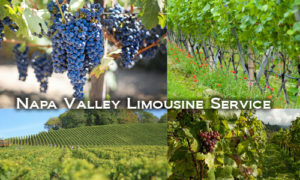 Reserve your Napa Valley Limousine Service Today! Are you flying in from out of town? Not to worry. 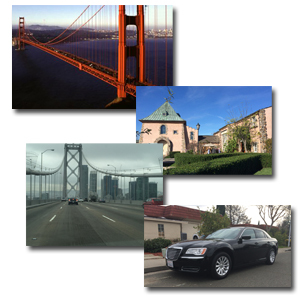 Our Limo Service can pick you up from any of the Bay Area airports. A reservation with Bay Area Car Service allows you to bypass all the hassles of securing transportation at the airport. If you’re thinking about renting a car for the weekend, think again. This means that you or one of your party members will run the risk of drinking and driving. Our hourly rates are an affordable alternative to car rentals. On departure from your trip, our chauffeurs will ensure you make it to the airport with plenty of time to spare. Tour The Napa Valley in Style. Don’t depend on a taxi or Uber, you may wind up waiting in the rain and cold. Our friendly chauffeurs will pick you up where and when it is convenient for you, any time of the day, dropping you off directly at the wineries of your choice. Spend as little or as much time as you like at each winery. You know how it goes – you visit a couple wineries but then you get to that magic winery that touches your heart. You and your date are having the time of your life. If you are on a wine tour bus you would have no choice but to leave with your group. Forget that, stay as long as you’d like. We’ll be waiting for you. This happens a lot at the wineries – you meet some strangers that recommend another winery. You want to go see it but its not on your itinerary. Or this scenario which happened to me. I met a girl while on a wine tour. We were hitting it off when I heard “its time to go”. I wanted to stay and get to know her better but instead I said goodbye. That will never happen with us. You decide when and where to go. Our Napa Valley Limo Service will get you to your home, hotel or office safely and quickly. That’s our guarantee. We know that flying – or even just getting to the airport – can be nerve-wracking, especially when dealing with picking up and dropped off strangers; let us take over the driving while you take a break. Ready to book a car? Call 1.800.380.9788 or click here to reserve your Napa Valley Limousine Service!